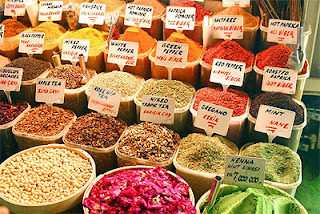 I love spices. I love the way they look, I love arty photos of them, the golden colours and fiery reds and orange, every shade of bark and root. I love their smells, their tastes, and their long, rich history in civilization. These are photos from various sources of inspiration. My favourite place to be is parusing the wares at The House of Spices in Kensington Market (in Toronto). The sign is old and peeling, the shop looks like a garage, but they have every spice, nut, seed, bean, legume and dried herb under the sun. You are totally right! The House Of Spice DOES have everything. I found all these random spices there a few weeks ago after hours of searching (other places) - fenugreek, cardamom seeds (not ground, or pods), asoefitida, and a couple other bizarre spices.